I’m fairly skint (blame Ghost and Def Leppard) so hopefully there’s nothing good out today… fingers crossed! Ahh baws. Writer/musician Ian Glasper turns the spotlight on the overlooked UK thrash scene with this exciting box set and companion book. The CD set has five whole discs (separated into various areas of the UK) and it looks like a total blast and great value too. There are always going to be gripes and omissions with this kind of thing but who cares? Both the book and box set are getting bought pronto. Double baws! The incredible, bonkers Megadebut gets reissued (again) with bonus stuff and some sort of re-recorded version of These Boots. Glad I’ve got the original version on LP but I want this too. You can never have too many versions of albums like this! A must(aine) buy. All that metal thrashing madness leaves me with little interest in the snail’s pace doom of Yob and their new album Our Raw Heart. But it sounds like a good ‘un so I daresay I’ll have to investigate it eventually. Tomb Mold’s Manor Of Infinite Forms, their second album of putrid death metal, sounds more up my alley. And then there’s Zeal & Ardor’s second album Stranger Fruit. Lots of people loving this but I don’t get it. What am I missing? I’ve been dipping in and out of Julian Cope’s entertaining book Copendium and came across his concept of the “boneyard” position. Basically, the boneyard is the penultimate placing on an album. Cope reasons that, if a band is stuck with a filler track it has to use, it will be placed in the album’s boneyard where it’s more likely to be overlooked. It got me thinking. So, for a fun experiment, I’ve picked five albums at random to see if this concept holds up. I’m going to take a look at each one and decided if its penultimate track belongs in… THE BONEYARD! So, the boneyards have it… but only just. It’s close enough that another random selection might have went the other way. Obviously, the concept relies on there being a filler track in the first place (and the artist being self-aware enough to know that a given track is sub-par). Also, for the sake of discussion, Cope applies the concept chiefly to vinyl but does the boneyard concept apply equally to albums designed for CD or Spotify? Hope you enjoyed this. Let me know what you think about the boneyard position and my examples. Got any good examples of your own? Or exceptions? Chip in below. 2016 will be the 30th anniversary of Candlemass’ debut Epicus Doomicus Metallicus. Lots of exciting plans have been announced to mark the great event. A new EP with new vocalist Mats Leven and a box set planned too. I’ll doom dance to that! And you can doom dance to this too! A free download of a massively rare Candlemass demo! The new Megadave album details have been announced and there’s a new song to check out too. I didn’t find the new song particularly involving though: too by-the-numbers for my liking. I do like the album cover though! I reviewed the excellent debut from Shrines. It’s still monopolising my listening time and still getting better with every listen. Read about them here and expect to see them in my end-of-year list. Also, some of the band’s members are also in a band called Obscene Entity. The advance word on their upcoming full-length is very positive so I treated myself to their self-titled EP on Bandcamp. 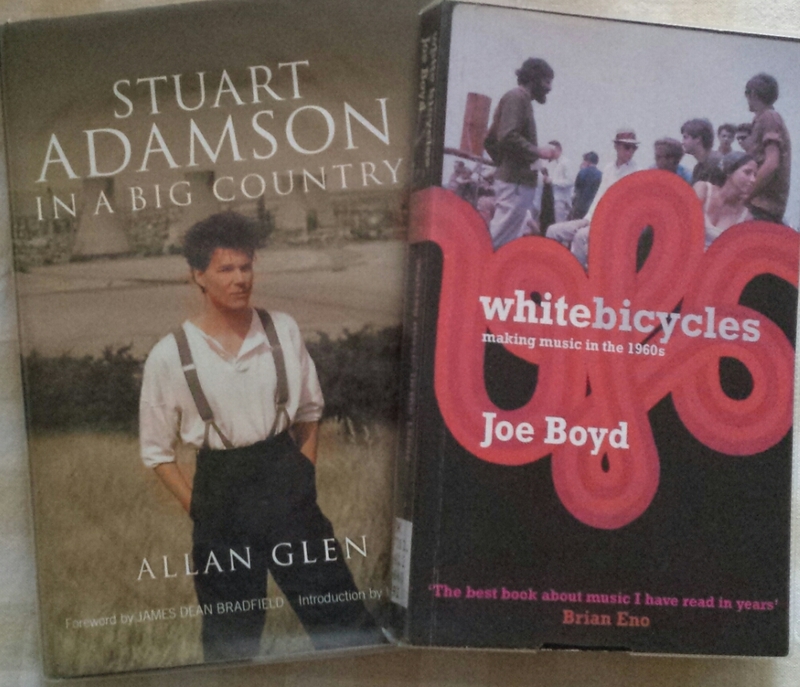 I did excellent library sale shopping. Got these and only came out £2 lighter. PaRtY-cAnNoN have gone viral again. Well, their logo has anyway. You can read about their new album here if you haven’t already. 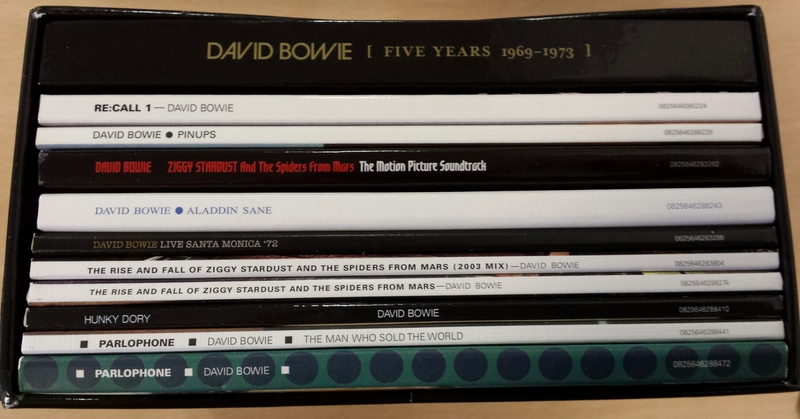 I bought the new Bowie box set Five Years 1969-1973 so there’s been lot of that going on. I’m listening to Live Santa Monica ’72 as I write this. But other than Shrines and Bowie what has the HMOverlord been listening to this week? Here’s some highlights. PaRtY-cAnNoN’s EP Partied in Half got a spin. The “old enough for what?” intro is the best opening to a CD. Ever. Primordial’s sublime The Gathering Wilderness is still as stirring as ever. And speaking of stirring, Big Country’s Steeltown and The Seer have been hitting that spot too. I’m enjoying Atheist’s Unquestionable Presence a lot. It’s fantastic proggy death metal with Martin Walkyier-style vocals and the new reissue is well worth your time and money. And, on the subject of proggy death, I also listened to Gorguts’ Obscura. It sounds a bit like Gojira being shoved down a big flight of stairs. Excellent! Been listening to the Jimi Hendrix Experience box set a bit too but I only seem to have a limited endurance for Hendrix these days. I can only get into it in small doses. And that’s been my week pretty much. Hope you enjoyed the notes and links and… happy listening!